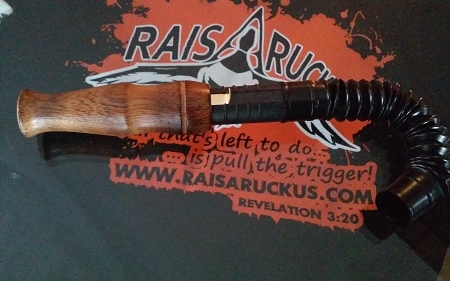 A fantastic Sounding hand turned Deer Grunt with a slide adjustment lever so that the call does not require taking apart in the stand to change the sound of the deer you are mimicking. Be a Doe grunt or bleat and in a split second be a following dominant buck or simulate two different bucks preparing to do battle. If you are like to rattle horns this is a must have. In several types of woods, all are hand turned into heir loom quality style all backed with a life time warranty! 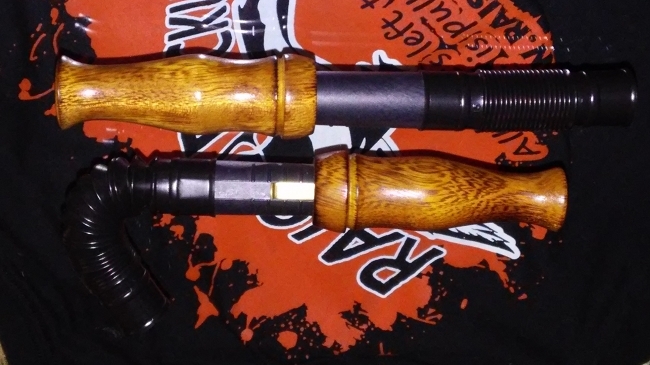 Made of Iroko, Sapele, Zebra Wood, Cherry, and Walnut. The Iroko burn series is created by artistically applying heat to the call to bring out very interesting grain patterns... It is a beautiful technique for the call.